The CCES welcomes the opportunity to meet Canadian athletes face to face. A CCES presentation or outreach booth can add an interesting and informative component to a tournament, meet or training camp. Our presentations are focused on the Canadian Anti-Doping Program, including information about banned substances and methods, the sample collection process, the whereabouts program, as well as the importance of values-based sport. Sessions are led by experienced and knowledgeable doping control officers. 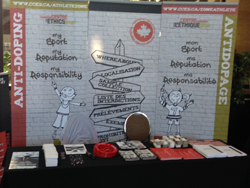 Outreach booths provide opportunities for athletes and support personnel to ask questions and have conversations about anti-doping and ethical sport with friendly and knowledgeable CCES representatives.